The hand-painted jigsaw, featuring five Kings of the Claddagh sailing past the Long Walk, by local artist Brendan Grehan. 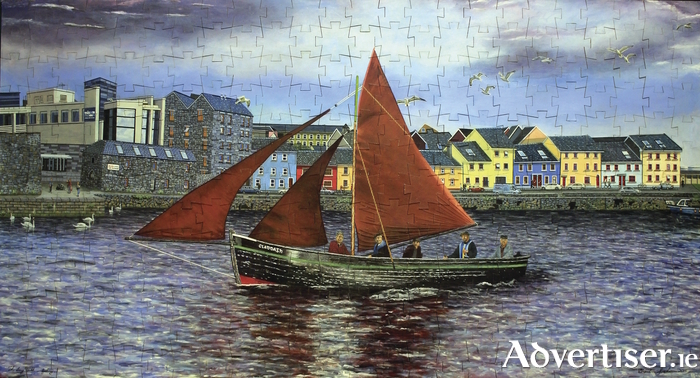 The large scale jigsaw was created by local artist Brendan Grehan, as part of his work with the Tús Initiative in association with the Social Enterprise division of Galway City Partnership. It will be donated to the school for appreciation and also for use as an educational aid. The original concept for the project was developed by GCP’s Social Enterprise Development Officer in association with Tomás Ó Cadhain of Olde Ireland. Grehan’s intention was to capture the essence of one of Galway city’s iconic views by incorporating the nature, history and culture of the Claddagh. The artist, a fine art graduate of GMIT, who has worked with numerous arts groups and festivals since the 1980s, spent much of his time on this project working in Claddagh School itself.